Head holder: A silicon “donut” or similar device is used to stabilize the head on the operative table. Parietal-supine: The child is placed supine with the head flexed for parietal lesions (16). Occipital-prone: The prone position is used for occipital encephaloceles (16). Standard skin preparation: Skin preparation is generally made with betadine (clorhexidine if patient is allergic to iodine). 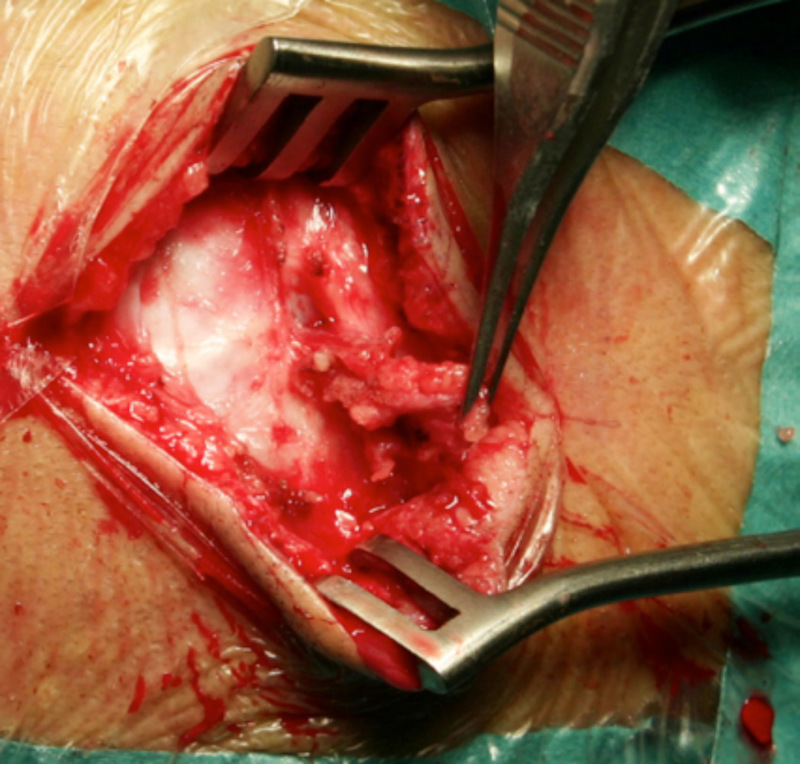 Gentle cleaning with saline of the lesion is used in the exceptional case with CSF leakage. Skin incision at margins: An elliptic skin incision is performed at the margins of the malformation. Scalp separated from surrounding periostium: Careful dissection is carried out to expose the encephalocele dome, its sac, and the stalk. Stalk separated from dura: The stalk usually attaches to the dura mater or to the sagittal sinus; occasionally it is continuous with the subarachnoid space. The malformation stem is coagulated with bipolar forceps and sectioned flush with the dura or the sinus. Dura not opened: Intradural exploration is unnecessary and adds significant risk of injury to the sinus. Coverage of skull defect: Pieces of bone are obtained from the margins of the cranial defect and placed on the dura mater of the skull defect to restore normal anatomy. In the author’s experience, congenital bone defects do not ossify spontaneously (16). Routine scalp closure: The galea aponeurotica is closed with 3/0 absorbable suture and the skin with 3/0 silk or staples. Undermining of adjacent skin can be performed if needed to avoid closure under tension. No drains: Wound dressings under slight pressure are usually sufficient to prevent subcutaneous blood collections.